Vacation rental condominium. Sleeps 10, 4 bedrooms, 2.5 bathrooms. No pets allowed. This home does not allow pets and does not have air conditioning. The elevator is non operational. This unit has a maximum occupancy of ten (mix of adults and children) and is not suitable for more than 9 adults. Please keep this in mind while booking the unit. Upon entering this beautiful space, one notices the attention to detail in all of its furnishings, art and accessories. Every item in this residence was designed by the award-winning design team, Friedman and Shields. The ivory travertine floor and light interior is accented by jewel tones, giving this well appointed condo a luxurious feel. A fully furnished kitchen with a built-in table offers ample space for working and seating located in the heart of the home. Lovely commissioned artwork appears throughout. The bedrooms are thoughtfully designed with custom bed treatments and the finest linens. The master bedroom and bath offer the resident a serene, elegant sanctuary. 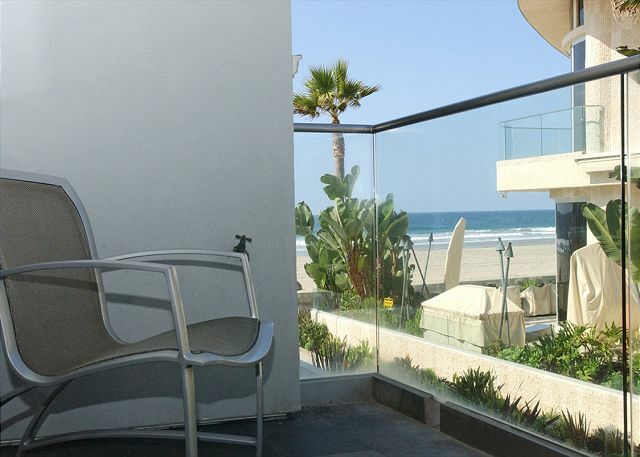 Lounge chairs and seating on the balconies offer a place to enjoy the beautiful ocean views and sunsets. The condo, located on the second floor, has both stairs accompanied by the two car garage. There is a King bed in the master bedroom, Queen in both the second and third bedrooms, and bunk beds in the fourth bedroom with a Full on the bottom, Twin on top, and pull-out Twin trundle underneath. 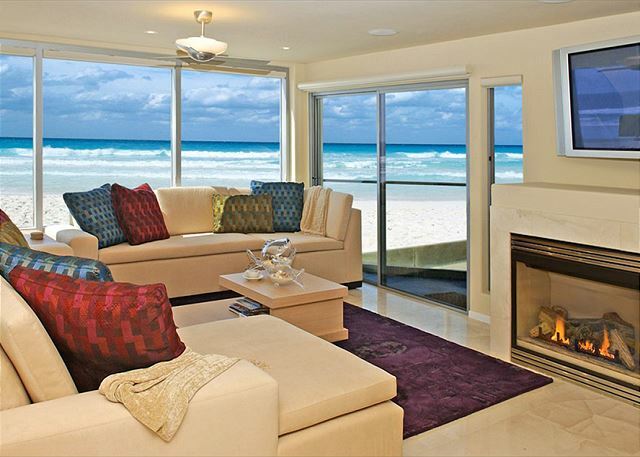 Exquisite newer four bedroom , two and a half bath second floor ocean front luxury condo. You will not find a better location on the beach, and there are three separate patios and views of the ocean from most rooms. Professionally decorated with high quality furnishings throughout. Granite counter tops with marble flooring and designer couches. A real gem! Deluxe state of the art kitchen open to the dining area. If luxury is a must, then this is the unit for you! Parking is limited throughout the Mission Bay area. Please be sure the vehicle you bring will fit in the designated garage, please contact us with any questions.The 2 car tandem garage measurements are: 6'7" H x 8'1" W x 34' L.
forward to more stays here in the near future. 5 weeks of vacation on the ocean. Great Stay and great place. Thank you for the nice review. We look forward to having you stay with us again. We stay here every year. Very clean and nice and an outstanding location and view. Thank you for staying with us again and the wonderful review. We love having you back every year and look forward to seeing you next year. Beautiful house. We loved the location. The house was perfect. The property was perfect for our family of 7. The extra bathroom (3) made it so much more convenient. The location was outstanding and we walked to the beach, dinner and exercise. We will request this property the next time we come to San Diego. The only negative comment is that the tenant next door (orange building) did not abide by the 10:00 pm policy for noise and the families were too loud. The condo is very nice and spacious with 4 bedrooms. The location is perfect - right on the beach but not near public parking so the beach isn't as crowded. Having the bunks and trundle in one room worked well for the kids. The tandem garage was convenient to keep beach chairs and bikes on the ground level n addition to the car. The only downside was the condo does not have air conditioning and in August it can get hot. The condo is equipped with many fans to help with air flow, but on a hot day it can be uncomfortable. Great location in the heart of Mission Beach. The property was very nice and clean. We were on the second floor and there was no marking on the building so it was a little hard to find at first. We ended up renting beach chairs and buying a football for the kids to play with. Didn’t realize until the last day that their are these items in the garage. Would have been helpful if the binder inside outlined this along with grocery stores in the area that deliver. Wonderful location and fantastic accommodations. Perfect for our weekend trip to see the water and enjoy the beach. This was an amazing property to spend a long weekend. There were seven of us ladies celebrating a couple birthdays and this property was perfect. It was luxurious, fully supplied, Had a beautiful view of the beach and a big room the living room for us to sit around and enjoy our wine. I plan to return as soon as possible. We had a great experience for our annual trip. You couldn’t beat the location or the space. The condo was very well kept and in great condition. The only drawback is that each level (3 total) are owned and managed separately. We had some discourteous neighbors above, but a mild annoyance at best and didn’t detract too much from our total experience. Great place and I’d recommend to anyone looking for a great time in San Diego. Our family of 4 had one of the best vacations in this beautiful condo right in the beach. Awesome location right down the walk from Belmont Park, yet it still felt so private. This condo was clean and had everything we needed. We had a great time here and are already looking into when we can rent here again. This place is the best ever. 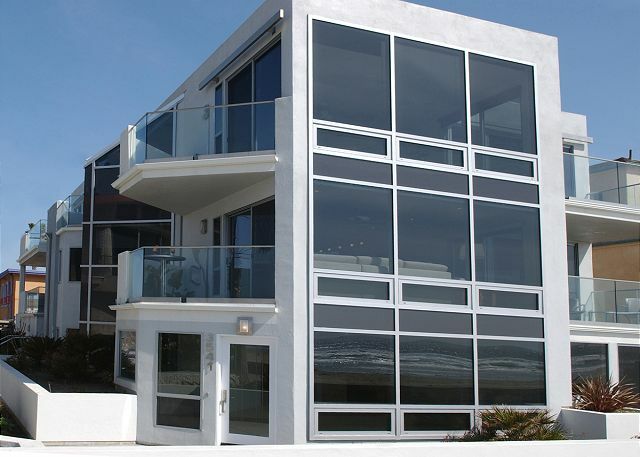 Clean, perfect location, great surrounding neighbors and the most spectacular view of the ocean. This VRBO is a great location, has great amenities, and is run by an outstanding property management team. We loved this property! Very clean and large! Lots of room and lots of beds! Loved how we could watch the kids playing at the beach from the deck. Would definitely stay there again! A very nicely designed and equipped unit located close enough to walk to breakfast! It has more storage than most homes. 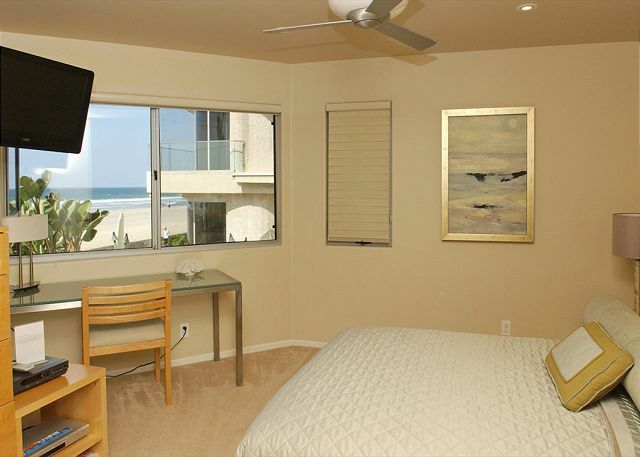 A cool feature, I watched the surf break from the master bedroom SHOWER. All the bedrooms had good televisions. Some of the windows wouldn't open but most did. My group (2 couples, each with their children) LOVED this vacation home! The location is perfect. It's just between 2 busier areas to the north and south, so it's not as loud and crowded. But it's in walking distance to PB, Belmont Park, bars, restaurants, etc. The house was furnished very nicely, was VERY clean, and the view is simply amazing. Your front yard is the beach. Perfect for families with children. Loved it and can't wait to return. Our stay was wonderful. The layout of the condo met our needs. The location was breathtaking. The amenities were overwhelming. The kitchen had every thing we needed. The property was very clean and eye appealing. The managers of the property went the extra mile to accommidate my famile. The first property we rented, two months ago when we arrived we found out we had been "scammed", another management. The managers of this property worked with me and was able to get us into this property. I will have no problem recommending this property to anyone. Our next stay, I will contact this manager. We were in walking distance of everything we needed. My son's birthday was on the August 3rd, he loves Joe"s Crab Shack, we walked to it. It was great. To wake up each morning , open the blind's, and be greeted by a view of the ocean was awesome. Thank You To The Property Managers. We are going back next year, that says it all. We were a group of 9 staying for 3 nights. House was exactly as promised; well-stocked, clean, and very comfortable. The location was perfect and the owner was very hospitable. We were exceptional pleased and will be returning! Strongly recommend. The condo was in clean, excellent condition, very comfortable, with a fully stocked kitchen for meal prep and comfy beds. Located half way between Mission and Pacific beaches meant no crowding on the beach. Bike rental at Cheap rentals got our family around easily to the local restaurants, shops and ice cream. Loved staying here! Great sunsets! Fantastic Experience. Property is in a great location, is very well maintained, and offers ample room for all. Excellent, overall. Kids complained about lack of fans in their rooms. Some came in to sleep with us. John, Sorry that your kids complained about lack of fans because there are ceiling fans in every room. But we could' ve provided you with a floor fan of some sort. Next time just let us know. Best views on the boardwalk! Friendly staff, wonderful accommodations, great follow up with any questions or issues with residence. The folks at San Diego Vacation Rental were awesome to work with. Found exactly what we needed and helped us thorough the simple process. I will see them next summer. great place, great week except for the constant pounding of footsteps from upstairs.Also there was only one router so wifi only worked in front rooms (not in back bedrooms). Our family loved this condo and it's location! Beautiful,spacious condo with a gorgeous view! Hope to be back again soon! Excellent location - SDVR staff were GREAT! Wonderful upscale, clean, prime accommodations. Waking up to the fresh air, morning surf and dolphins, and ending the day with picturesque sunsets was more than we could have imagined. Thank you for chosing San Diego Vacation Rentals and Realty, we appreciate your business and are very happy to hear you enjoyed your stay! We hope you will always call us in the future for all you vacation rental needs!!!! We enjoyed two locations and used this one as our gathering place so it is spacious for dinner for 18! Loved the location, view and ease of use. Our first visit to SoCal for family including adult daughter and son and their spouses. The property has great location -saw dolphins every day and surfers ever present. Some of the furniture is showing wear but still comfortable. Was generally clean although not spotless. Kitchen large with ample pots,pans etc. Layout was great for us but may be less than ideal for a family with small children as some bedrooms are remote from master. Also be aware the location was fairly noisy at night. SDVR was great - we would recommend them and will use them if we return to SanDiego area.